Sadly, we’ve run out of wristbands and key rings. Very grateful for everyone’s support – we’ve sold out super early this year! Our LifeSIGNS self-injury awareness wristbands are back for 2018, and ready for Self-Injury Awareness Day on the 1st of March. 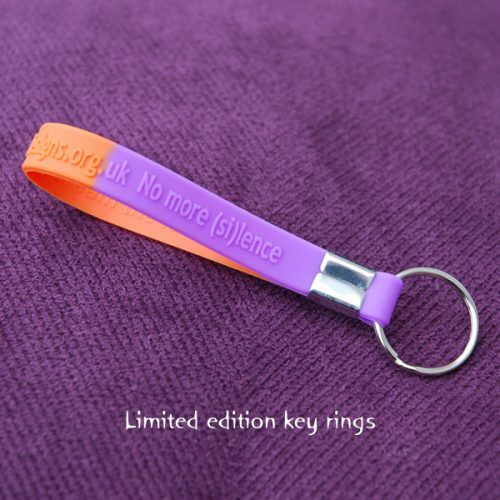 The wristbands (and key rings, while they last) are two-coloured again, purple and orange. Orange is the colour for SI awareness and for SIAD. 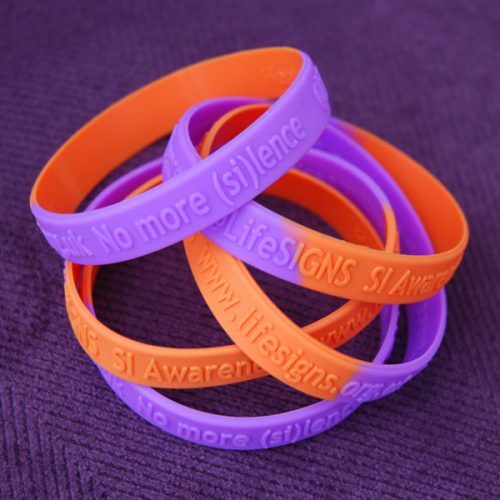 The message on the outside says “@LifeSIGNS SI Awareness No more (si)lence” — so they do not mention self-injury directly. This lets you choose how to react if someone reads your wristband; you could choose to talk about self-injury, or you could simply say that you support a small mental health charity. This year’s secret message on the inside is lovely. 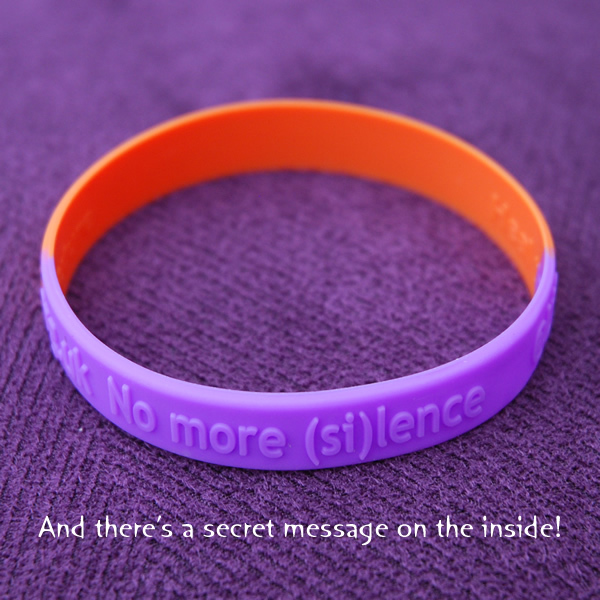 It’s a secret, just to give you a little boost when you wear your wristband; don’t tell anyone. Sadly, we will run out of wristbands and key rings very shortly. We are sorry if you’re visiting on the 1st of March, but the campaign was so successful and we’ve sold out. We start selling again in Jan / Feb 2019. We’re happy to send you one or more wristbands wherever you live. If you’re outside of the UK, please carefully select which button to press below. Are you in Europe or Eire? OK, easy, use the second button. If you’re outside the UK and Europe, please choose the third button, which covers the rest of the world, including America and Australasia. If you want five wristbands, that’s easy; just use the drop-down menu to select ‘5 wristbands’ and add them to your basket. If you want seven wristbands, that’s a bit trickier! First, add ‘5 wristbands’ to your basket, and then come back to this page and add ‘2 wristbands’ – your basket will remember. All prices include postage, packaging, and processing. We’re a small, unfunded charity; your generosity here will literally support all our work for the rest of 2018. We have sold out of wristbands and key rings. 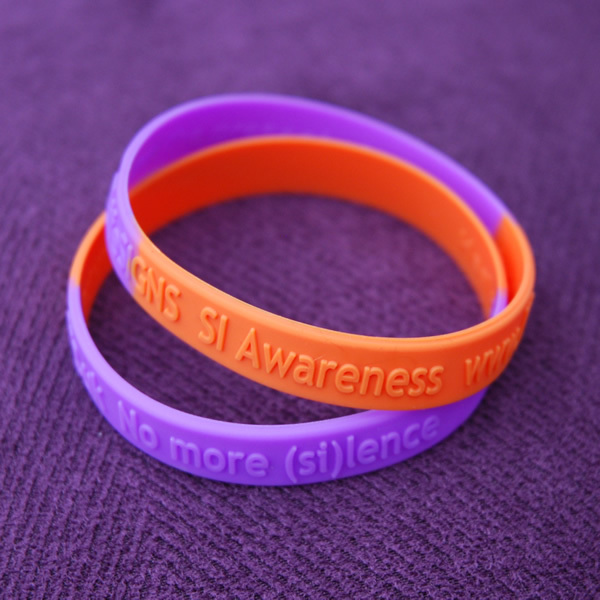 Thank you for all your support – make sure to have a good SIAD on the 1st of March. 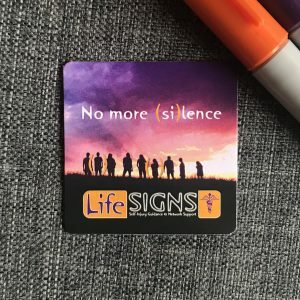 Check our SIA ‘no more (si)lence’ magnets. Available worldwide. Select your wristbands and / or key rings below, for delivery in the UK and Ireland. Postage and packaging are included in the price. You pay exactly what is shown, no more. You do not have to have a PayPal account to buy a wristband in the UK; you can use your debit card or whatever. Select your wristbands and / or key rings below, for delivery anywhere in Europe. Postage and packaging are included in the price. You pay exactly what is shown. Prices are shown in Great British Pounds, but will be automatically converted to your currency as you go through the checkout. You probably have to use your PayPal account. Select your wristbands and / or key rings below, for delivery across the whole world. Postage and packaging are included. Take a look at our little magnets. Brilliant for fridges, radiators, and who know’s what else? If you want a wristband and a magnet, just come back to this page – don’t worry, PayPal will remember your order and you can add a magnet to it. We will send wristbands to any country in the world. You do not have to do any calculations or send us any special currency; PayPal will do all the conversion for you, even if you use your card. In the UK, please allow 3 to 5 days for delivery. In Europe, please allow a bit over a week for delivery. We don’t know anything about your local postal service. In America and Australia (etc.) please allow for two weeks for delivery. We don’t know anything about your local postal service, or how long it takes for post to travel across the oceans. If you would like to buy 25, please email Wedge@lifesigns.org.uk and we will try to give you a little discount. 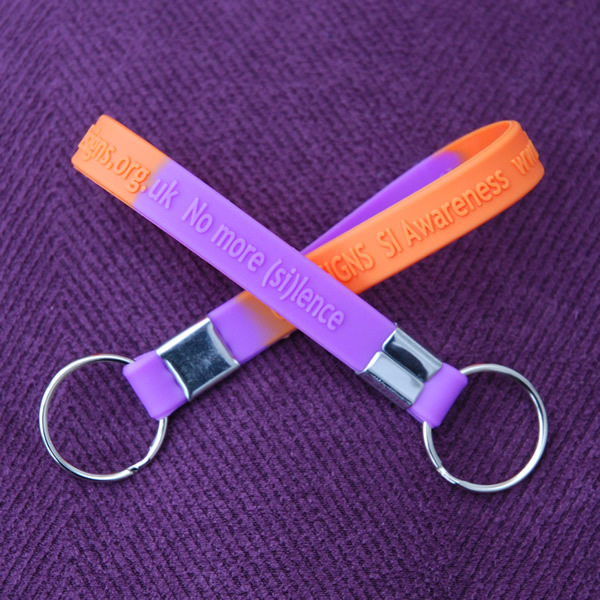 We’d love to see a picture of your wristband or keyring in the great outdoors or on you. Please share your pic and tag it #lifesigns and #SIAD – we’re sure to see it on Twitter, Tumblr, Facebook, and Instagram. You can directly share your pic on our Facebook Page too  (Our Page is safe – nobody shares pictures of wounds or scars). If you’d like it to be anonymous, upload your pic to our Tumblr. Click to see the answers. Is the UK separate from Europe? For postage purposes, yes. Let’s not go on about Brexit! Do you deliver to Spain? Thailand? Latvia? Yes, we send wristbands everywhere. Please use the correct button for European countries, and countries outside of Europe (like America and Australia). How much is a wristband in Canadian dollars? We can’t be certain, it depends on the currency rate at the time of your purchase. As there are 1.71 Canadian Dollars to 1 British Pound, then one wristband (at £5.60) should cost you less than $10. It’s free – or rather, it’s included in the total price. Is it cheaper to buy more? Yes, because the postage is kinda the same, you will save money by buying two or five wristbands. Can I buy 25 bracelets from you for our Group? Have key rings sold out? Maybe. If you cannot see them in the drop down menu then yes, we have sold out. Why can't I buy 5 key rings? Because they be fire and rare. Key rings are limited edition. We’d like to have two key rings maximum, but we guess you might get four if you work hard! Do you only sell them in the UK? Have we not said?!? We sell wristbands to anyone anywhere in the world. I don′t have a PayPal account, how do I buy a wristband? You can use PayPal to use your credit or debit card as long as you’re in the UK – you don’t actually have to have an account. Just buy your wristband and carefully follow the instructions. To repeat, UK people do not need a PayPal account – you can just use your debit or credit card. People outside of the UK probably have to have a PayPal account – not our rules, PayPal insists. Are you making profit from these sales? Well, yes, we are ‘making money’ from selling wristbands, but no, we are not making ‘profit’ as all ‘profit’ made goes back into buying more wristbands, leaflets, paper, ink, and all the other costs that help LifeSIGNS raise awareness about self-injury. Your generosity now in buy-in wristbands will fund our online services for the whole year ahead. We are a small unfunded charity. PayPal didn′t work for me, your web site is broken. PayPal is separate from us, and we are certain their system will work for you. Please close your browser, re-open your browser, ensure that you have cookies enabled and try again. You may want to try a different browser, or have a friend help you. PayPal.co.uk has a comprehensive help system, please use it. PayPal will work on mobile, but you might prefer to try again when on a laptop or desktop computer. We cannot accept cheques from anyone, sorry; you must pay by PayPal, debit card, or credit card. Will I be allergic to the silicone? Maybe – not many people are, but they are made of silicone so if you know you are allergic… maybe get a key ring instead. Why am I automatically added to your newsletter? Because we want to keep in touch with anyone who obviously supports us, but yes, you can opt-out at any time – no hard feelings. It’s part of our terms that we can contact you after a purchase; we add your address to save you the hassle, but we promise to respect your wishes and you can unsubscribe in two clicks. I have small hands, will the wristbands slip off me? Maybe, so you could either tie it on to your bag, or use an elastic band to make the wristband smaller. Consider getting a key ring for your bag / pencilcase. What′s the writing on the wristbands? 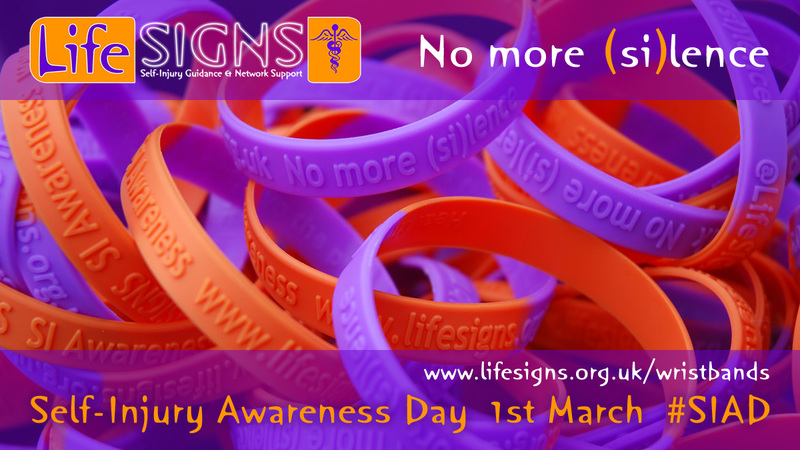 “@LifeSIGNS SI Awareness lifesigns.org.uk No more (si)lence”. Yeah, but what′s the secret message? We will add you to our mailing list. We only send a few newsletters through the year, and a few more in February in the run up to Self-Injury Awareness Day on the 1st of March. You can unsubscribe at any time. Are you planning to sell wristbands & keychains again for 2019? Will u sell them again this year? I’m very sorry to say that we are unlikely to sell wristbands in 2019. We don’t have the volunteers ready to manage the process, and we don’t have the people to train volunteers in the process. Very sorry. Please wish us well for 2019 as we consider how we can best support people this year and the next.